At present, total rural labo r force is abou t 450 million in Chin a, accounting for about 74% of th e total so cial labor force. on fitting curve of exponential function by SPSS statistical software. too much data that is difficult to calculate [1,2]. 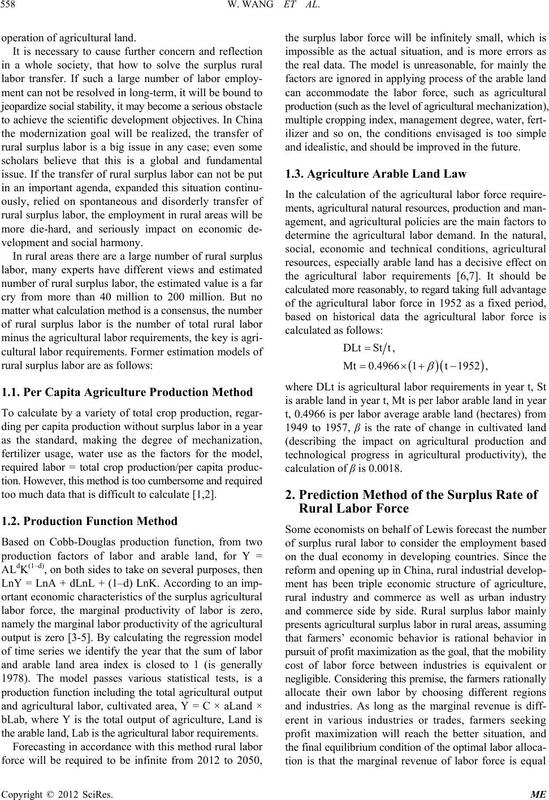 the arable land, Lab is the agricultural labor requirements. and idealistic, and should be improved in the future. 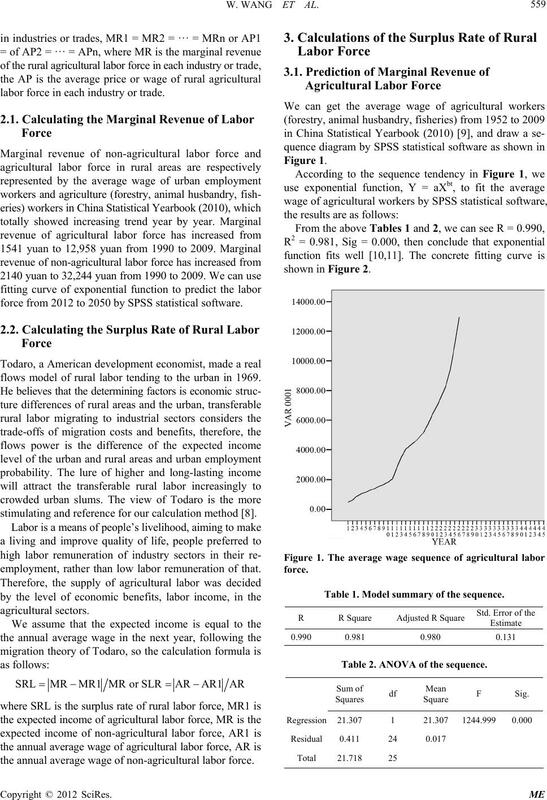 calculation of β is 0.0018.
labor force in each industry or trade. force from 2012 to 2050 by SPSS statistical software. 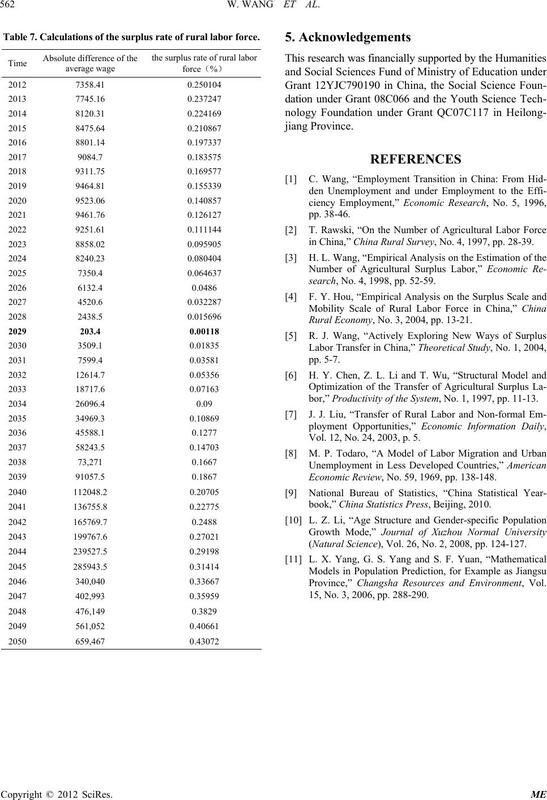 flows model of rural labor tending to the urban in 1969.
stimulating and reference for our calculation method . employment, rather than low labor remuneration of that. the annual average wage of non-agricultural labor force. Table 1. Model summary of the sequence. Table 2. ANOVA of the sequence. Figure 2. 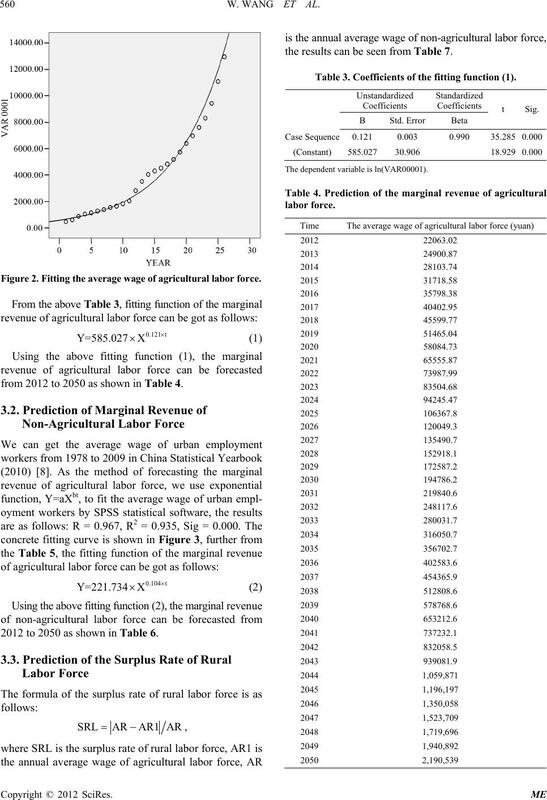 Fitting the average wage of agricultural labor force. from 2012 to 2050 as shown in Table 4. 2012 to 2050 as shown in Table 6.
the results can be seen from Table 7. Table 3. Coefficients of the fitting function (1). The depende nt variable is ln(V AR00001). Table 5. Coefficients of the fitting function (2). B Std. ErrorBeta t Sig. ization to migrate to urban. 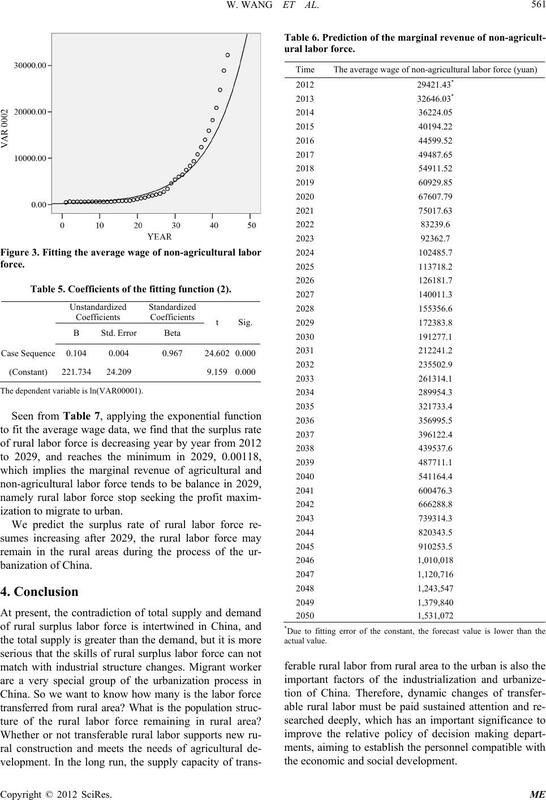 ture of the rural labor force remaining in rural area? the economic and social development. f rura l l abor force. 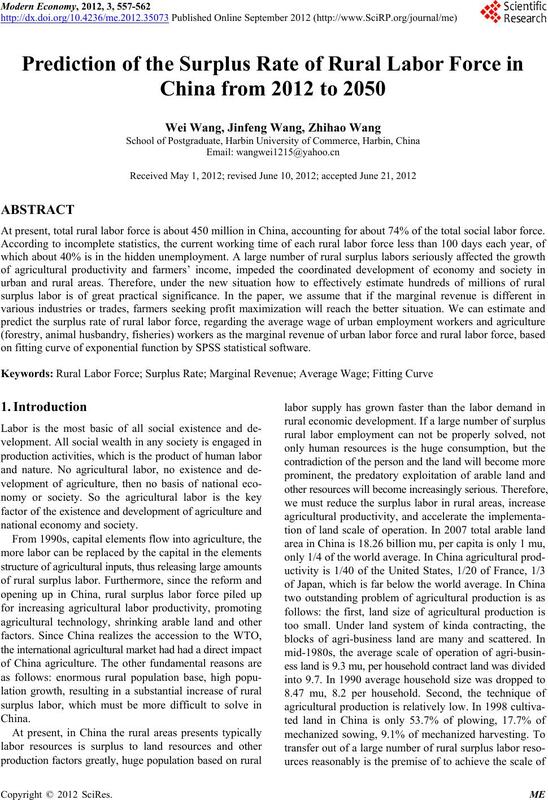 in China,” China Rural Survey, No. 4, 1997, pp. 28-39.
search, No. 4, 1998, pp. 52-59. Rural Economy, No. 3, 2004, pp. 13-21.
bor,” Productivity of the System, No. 1, 1997, pp. 11-13. Vol. 12, No. 24, 2003, p. 5. Economic Review, No. 59, 1969, pp. 138-148.
book,” China Statistics Press, Beijing, 2010. (Natural Science), Vol. 26, No. 2, 2008, pp. 124-127. Province,” Changsha Resources and Environment, Vol. 15, No. 3, 2006, pp. 288-290.